February 5–President John Magufuli (right) has said the Tanzanian government saved a huge chunk money in the procurement of its new electronic passports which were launched last week. Speaking during the ceremony, Magufuli said the e-passport project cost $57 million in contrast to an initial $200 million earlier quoted by another bidder. 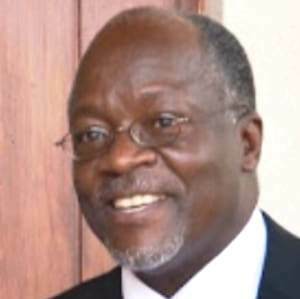 “As you can see, we saved a lot of money,” Magufuli told invited guests and officials. Magufuli has staked his presidency on stamping out corruption and making savings in government expenditure with measures that have frequently been described as draconian. The project was implemented by HID Global, an American security printing company. It is a subsidiary of Swedish firm, Assa Abloy, the world’s largest local maker. Boasting tamper proof electronic features, the e-passport launched at the Immigration Headquarters in Dar es Salaam, is expected to help the government end misuse or fraud associated with the current manual passport issuance system. Officials said at the ceremony that the electronic passport would link their borders to a central coordination system. Tanzania’s 40 embassies will be linked to the system which implies that nationals who lose their passports will find it much easier to get replacements due to one’s details being implanted on a chip. The chip that holds the same information that is printed on the passport’s data page, the holder’s name, date of birth, and other biographic information. The new e-passport database is enhanced with Automated Fingerprint Verification system (AFIS) to minimise fraud, identity theft, forgery and passport skimming. The electronic passport is part of the broader e-border management. The new development comes against the backdrop of last year’s directive at the 35th East African Community Council of Ministers meeting to begin issuance of the new EAC e-passports by January 31, 2018. This was after the consideration of the different status of preparedness by the Partner States during a meeting in Arusha. Two years ago, regional leaders ordered the phasing out of current machine readable East African and national passports from 1st January 2017 to 31 December 2018. While Kenya, Uganda and Rwanda reported to have had plans to commence issuance of the New International EA e-passport not later than April 2017, this dream is yet to be realised. It replaces the machine readable East African and ordinary passports issued by the member states and is available in diplomatic, service and ordinary categories. The new passport also comes with a biometric identifier and bears a digital photograph of the holder as well as digital security features to prevent unauthorised reading or ‘scanning’ of data stored. According to President Magufuli, the e-Passport is expected to boost free movement of people across the region and will be in line with implementation of the Common Market protocol which guaranteed the right to move between countries in East Africa.